An 8 ounce bag of Burundi Procasta. An 8 ounce bag of Brazil Peaberry Samambaia. A 3 ounce white Roastery mug. A 3 ounce stone Roastery mug. You must be a patient person. I tend to only visit the post office once a week, and so it could take time to get all these items in the mail. You must have an address in the United States. I will not ship internationally. You must be over the age of eighteen. You must share. Share, share, share. Find a favorite blog article here and find a way to share it. You could Facebook an article. You could tweet an article. You could use Flipboard. You could use Reddit. But you have to share something on this blog. The fact that you shared a blog post a week ago doesn’t count. I’m asking you to share something now. Also you have to share from THIS blog. Sharing from news stories where this blog is mentioned isn’t the same. If you wish, you could let me know if there is one of the above 7 items that you have your heart set on. You must have more than one name. I don’t care if you call yourself “Mary A.” or “Jeff 123” it’s just that when I’m putting together the giveaway, it gets confusing when there are 5 Sarahs who have all entered. You must be patient. Did I say that already? You must leave your comment before July 27, 2016 at 6:00 AM PST. If there are more than 250 entries, everything above 250 won’t count. The last valid entry will be the 250th. I’m going to update this article with the winners no later than 7 days from the end of the giveaway. If you don’t come forward and claim your prize within 2 weeks of me announcing the winners here, you forfeit it. Follow all of the above rules please! I don’t want there to be any confusion. This is not one person winning all 7 items above, rather this is 7 people each winning one of the above items. I can’t promise you’ll get the one you want. The Starbucks dress code update: Unnatural hair, blue jeans, plaids and patterns. Starbucks swag only at the first store. I tweeted the Cold Brew in a Bottle: Starbucks deliciousness article. I love cold brew and have been trying every variety that i can find. But my favorite is just a black cold brew. I shared the Mount Hope store in Rochester, New York story because it’s my hometown and I’ve visited that store multiple times. 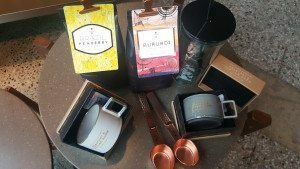 I shared this give away, I am a huge Starbucks fan and your blog is awesome, love being up to date and seeing new coffee drinks to try. Thanks for all you do, and this opportunity! I tweeted the “Four Cold Coffee Choices at Starbucks. Which one is right for you?” article. I’d like any of the two Roastery mugs. Thank you for your kind generosity in hosting this event! I work for Starbucks and I shared this article. Thanks for all your info. I shared the Updated Dress Code article on Facebook. The updates are so interesting! Hey Melody, today I shared your Caffe Verona article on Facebook. I chose this one because Verona is also my comfort coffee. I am a five year partner working in Oregon, and today I interviewed for (and accepted) a shift supervisor position. This is the second time this month I did a special tasting of Verona. Two weeks ago I presented this coffee,paired with the Rocky Road chocolate bar, as my Lucky Pick tasting at the Area 40 Barista Championship. When I got back to my home store after the event I dropped my favorite water bottle and it broke. The item I would love the most would be the reusable cold cup. 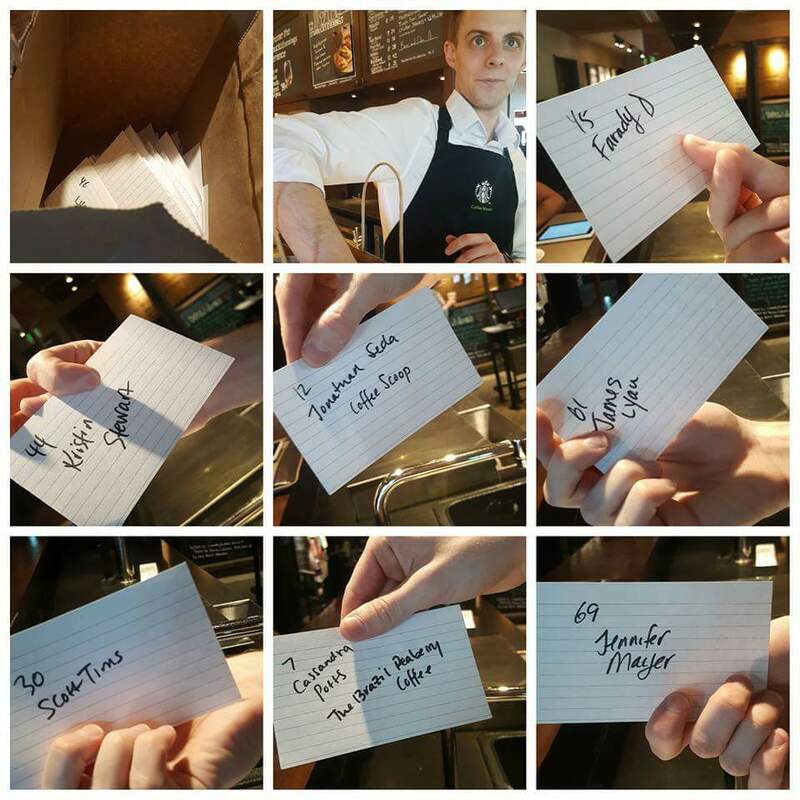 Thank you for always having words to express the true spirit of Starbucks culture, for partners and customers alike. Melody, this is awesome! I shared this post as well as the “Which cold coffee is right for you” on my FB because I really think people need to understand the difference and benefits of each! Same goes for the hot coffees. I really love the mugs but really have no preference. Thanks for the opportunity and thanks for always teaching me something new! I just shared on facebook the Viennese blend article from last year. House blend is my favorite but sometimes it’s nice to mix it up a bit, so thank you for the proportions! If I were to win, a scoop, the cold cup or a mug or the coffee would be my preference in descending order. I tweeted about the swag available only at the first store. I would love to win any of the prizes, but would adore the cold cup! Hi Melody! I just shared on FB the article Starbucks swag only at the first store because I love, love to visit this store when in Seattle! It has so much character and is unique to the neighborhood! Should I be chosen, I would love one of the coffees! Thank you for all of your posts! Thank you for being you! I tweeted the post Get Your Chill On: Ice, Green Straw, Deliciousness! If I could choose I would like one of the mugs or the reusable cup. I shared the California drive through concept store article on Twitter. Hi Melody! I love your blog! I tweeted the Cold Brew Close Up (using the coffee sock brew kit) article. I love making my own cold brew! It’s my new favorite thing to do (it’s soooo hot here in Texas). Although, I’m just using a large mason jar and a piece of muslin (food) cloth – it’s still delicious! Kati-Kati is my favorite for iced coffee/cold brew. So, if I win – I would love the cold cup (but all the prizes are awesome!). Thanks so much for doing a giveaway! I just shared the “untold history of Verona” on fb. I emailed your site to my friends in the Bitter Men’s Club (BMC) I have coffee/tea with every week. Our name came from one of your employees as one of us was in the drive thru and your employee asked where the rest of the bitter men’s club was lol. I guess we have a lot to complain about everything like government , voting etc…and were kinda loud at times lol. We even had shirts made up we wear to Starbucks now! I love reserve’s or the scoops if available. Oh btw forgot to tell you I don’t have fb or Twitter or any social media stuff. I’m old lol. Ack! I forgot (not trying to add an extra entry, I promise!) – I LOVE the 3 oz Roastery mugs. Either color. I collect tasting cups and have over 20! I shared “Fun with mango and caramelized honey: 10 drink ideas.,” on Facebook, because Mango is one of my most favored syrups and was so thankful when you gave extra drink combo ideas whent hey brought it in year-round. If I were to win the Reserve reusable cold cup would be amazing, as most things I order in Florida are iced, and I hate contributing to waste with the disposable plastic cups. Grats to the winners, and thanks for a great blog!